The craziness of the holiday season is over. Now comes the wedding season. 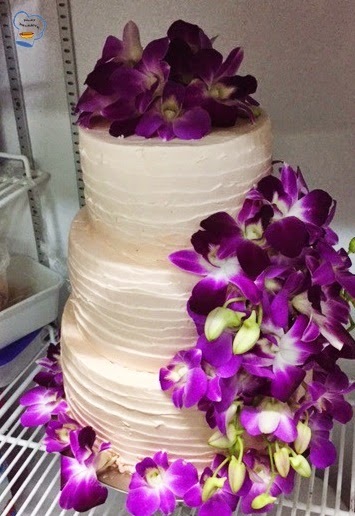 Just a few days after all the New Year celebrations wrapped up, I made the first wedding cake of 2015. The cake was three tiered red velvet frosted with light pink Swiss meringue butter cream in rustic style. It's not something new. I have done it several times before so the procedure went smoothly and quickly. I made no mistake (Sigh). I succeeded in resizing the recipes at the exact quantities required. Oh yes, I'm getting the hang of making wedding cakes. Good for me! The recipe used was taken from joyofbaking.com. The bottom was 4-pound cake, the middle tier 3 pounds and the top was 1-pound. I quadrupled the recipe and it was the right quantity for this size. I tried it with 3.5 before but the yield wasn't enough for the required height. I baked each cake in 2 tins so I could get the same height for the layers. I stacked four layers for each tier. 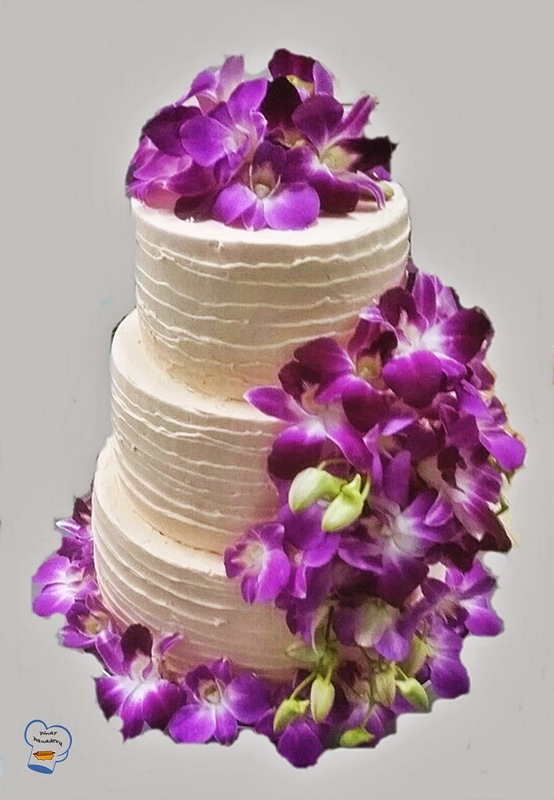 And as for the decoration, the florist added fresh Thai orchid to give the cake a perfect finish.